There are suggestions that Phobos may actually contain ice or water in its interior! Some carbonaceous meteorites contain 10 to 20% water (in the form of H2O molecules trapped in minerals) — possibly a valuable material for future astronauts. Phobos itself has a strikingly low density of about 1.9 grams/cm3, which requires either empty pore space in a possible “rubble pile” structure, or ice, or both. Some of the crater pits arranged in rows along fractures give an appearance of blow-holes, possibly from release of water vapor from interior ice, when the fractures formed. The origin of Phobos and its neighbor moon Deimos is very puzzling. They look like captured carbonaceous asteroids — but the capture process is low probability. For example, an approaching asteroid might have been slowed down in an early extensive Mars atmosphere, but then the atmosphere would have to quickly disappear to avoid having Phobos experience further drag, spiral in rapidly, and crash on Mars. Furthermore, Phobos and Deimos both lie over the Martian equator, hinting that they arrived there by tidal effects operating on a much larger parent body — an early moon broken up by a later impact? Interest is growing in Phobos missions, planned by various countries, that may solve these problems and look for water resources that might aid future human exploration of Mars. Casotto S, Tonello A, Bardella M. 2005. Phobos imaging and mapping preliminary mission design. Advances in the Astronautical Sciences, 119, 2029-2049. Gendrin A, Langevin Y, Erard S. 2005. ISM observation of Phobos reinvestigated: Identification of a mixture of olivine and low-calcium pyroxene. Journal of Geophysical Research E: Planets 110:1-13. Lynch DK, Russell RW, Rudy RJ, Mazuk S, Venturini CC, Hammel HB, Sykes MV, Puetter RC, Perry RB. 2007. Infrared spectra of Deimos (1-13 µm) and Phobos (3-13 µm). Astronomical Journal 134:1459-1463. Makuch M, Krivov AV, Spahn F. 2005. Long-term dynamical evolution of dusty ejecta from Deimos. Planetary and Space Science 53:357-369. Murchie S, Thomas N, Britt D, Herkenhoff K, Bell JF, . 1999. Mars Pathfinder spectral measurements of Phobos and Deimos: Comparison with previous data. Journal of Geophysical Research 104:9069-9079. Rahe J, Mukhin L, Sagdeev R, Karavasilis K, Trombka J, Zakharov A, Medvedev A, Khatulev V, Yuriev V. 1999. Low cost mission to phobos and deimos. Acta Astronautica 45:301-309. Simonelli DP, Wisz M, Switala A, Adinolfi D, Veverka J, Thomas PC, Helfenstein P. 1998. Photometric Properties of Phobos Surface Materials From Viking Images. Icarus 131:52-77. Thomas N, Britt DT, Herkenhoff KE, Murchie SL, Semenov B, Keller HU, Smith PH. 1999. 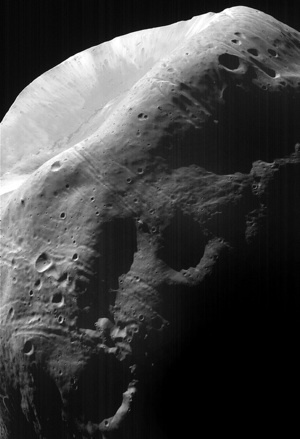 Observations of Phobos, Deimos, and bright stars with the Imager for Mars Pathfinder. Journal of Geophysical Research 104:9055-9068.